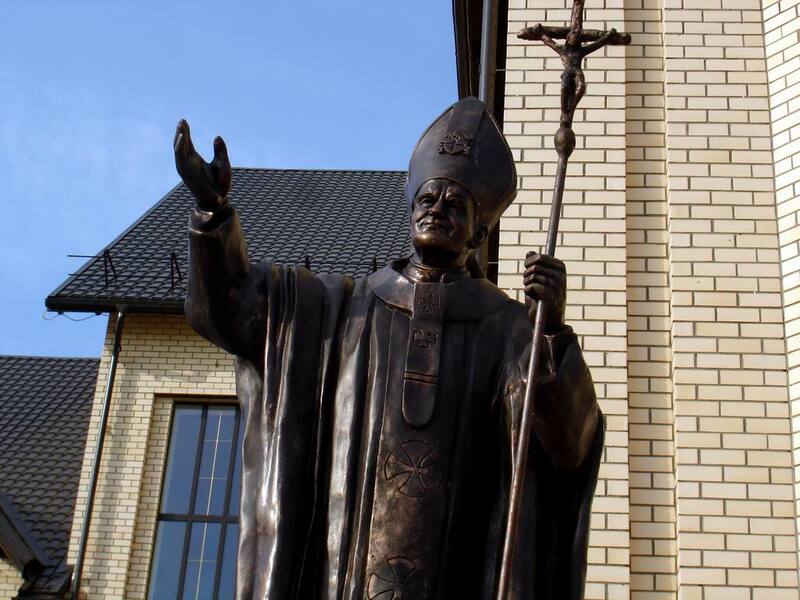 The monument to the Catholic head Pope John Paul II, set in the city of Vitebsk in the courtyard of the church of Jesus the Merciful, is interesting because it was brought as a gift to Vitebsk Catholic believers from Poland. The opening of the monument took place on September 21, 2008, when the Catholic Church celebrated the 30th anniversary of the choice of John Paul to the Roman throne. 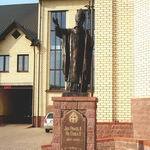 Monument to John Paul II, this modern Vitebsk attraction, Polish Catholics produced at their own expense. It features the figure of the Pope blessing the parish with a cross. The height of the monument is about 4.5 meters. A red granite board shows an emblem of Pope John Paul and his name in two languages: Polish, Belarusian, and the years of the Pope`s life (1920-2005). The opening ceremony of the newest monument in Vitebsk was attended by representatives of not only the Catholic Church in Vitebsk, Belarus, in particular the head of the church Martin Vidovic and bishop of Vitebsk Diocese Vladislav Blin, but also Polish Ambassador Henryk Litwin together with Consul of Poland in Minsk Krishtof Sviderek. This is the case when the culture of Catholic Vitebsk is closely intertwined with Polish culture. It should be noted that this is not the first monument on Belarusian land, built in honour of John Paul. The first appeared also in Vitebsk region – near the main entrance to the church of St.Anne in the village of Mosar, Glubokoe district – immediately after his death, on August 15, 2005. 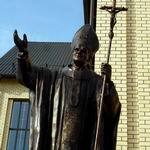 And a monument to the current head of Catholicism - Pope Benedict XVI was opened in the village of Luchay, near Postavy in June 2011. It is interesting that the monument to Pope John Paul II was installed near the Cathedral Church of Jesus the Merciful which was the still under construction at that time and the area around the monument was guarded by no one. As a result, unknown vandals attempted twice on the monument, breaking off the pontiff's staff. 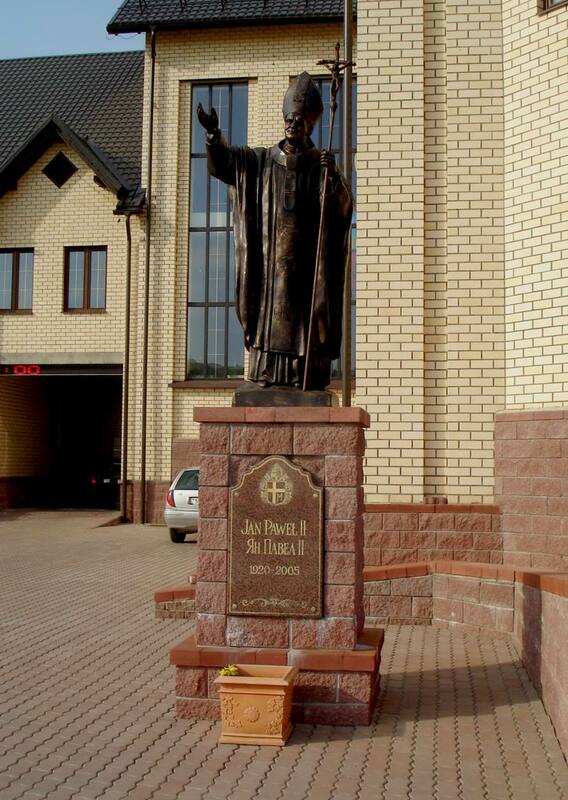 The monument to Pope John Paul II is located in the courtyard of the Church of Jesus the Merciful, 28 Soldiers-Internationalists str., Vitebsk. What to see in Vitebsk on the territory of "South-7" area where the monument is located? Portal about Vitebsk VitebskCity.by recommends to pay attention to the museum of Soldiers Internationalists, keeping the names of Afghan war heroes who lived in Vitebsk. You can pray for the heroes in the little church of St.Andrew the First-Called. Those who keep up to the times and adhere healthy lifestyle, please welcome to the building of the Ice Palace with numerous sporting events.